In search of a more comfortable home, many people turn to various forms of heating equipment during the winter months. The easiest source of room comfort are space heaters. These very pieces of equipment, however, are responsible for nearly 2 out of every 5 home heating fires according to the National Fire Protection Association. Space heaters contribute to more than half of home fires that ultimately result in death. 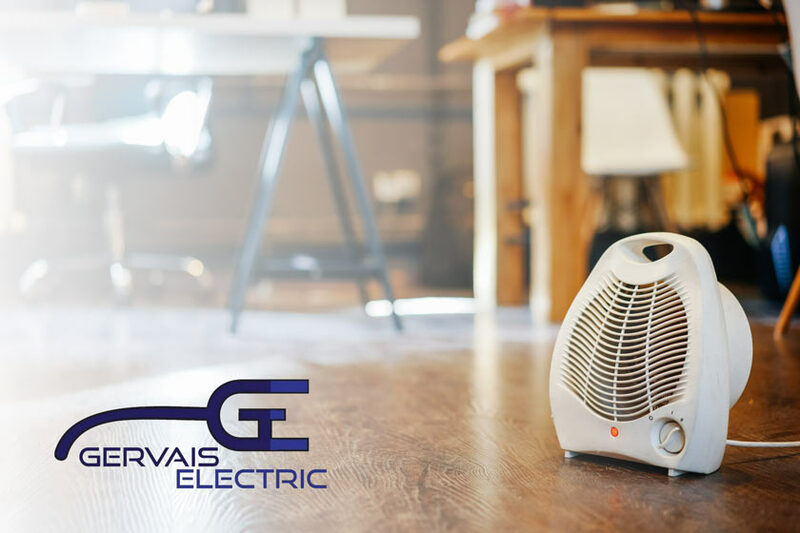 Though portable electric space heaters can be a convenient and effective way to provide additional heat in your home during the winter months, they can also contribute to both electrical shock and fire hazards. Such is the case, especially when these portable heaters are not equipped with safety features or are improperly plugged in during use. When using portable space heaters, it is critical that safety is your number one concern. The professionals at Gervais Electric have some important facts and tips to offer to homeowners in their efforts to keep their homes safe this winter season. Be sure to read all the instructions and warning labels thoroughly before you begin use of space heaters. Be sure that plugs are not worn, damaged, cracked or broken and that you have no loose connections. If any of these are present, do not use the heater since it can cause danger to you, your family and your home. Your portable heater should never be left unattended. If you are heading out or retiring for the evening, be sure to turn your heater off. Never let your pets or your children near a space heater. Be sure to place space heaters at least 3-4 feet away from any items that can easily burn such as clothing, rugs, papers, tablecloths, and plastics. Place heaters in an area of the home that is not high traffic so as to avoid tripping. Never plug your portable heaters into an extension cord or even a power strip. You should plug the heater directly into a wall outlet and be sure that nothing else is plugged into that same outlet. Remember space heaters only serve to provide additional heat and should not be used for any other purpose. Be sure to place your portable heater on a flat surface. You should never put your heater on top of tables, cabinets or other pieces of furniture. In addition, you should not place space heaters on carpeting since this can lead to a fire. Whenever your heater is not in use, be sure to unplug it and put it safely out of the way. Now that the colder weather has made its presence known, we all take steps to provide heat and comfort to both our families and our homes. However, we cannot emphasize enough the importance of using these safety tips whenever you choose to use a space heater as an additional heating source. Disregarding these important facts and tips can ultimately lead to a variety of hazards in your home. Winter can be somewhat challenging for many of us, but with proper care and attention you can enjoy the convenience and comfort that top-quality portable space heaters can bring to your home and living space. For more information about these portable heaters or if you find yourself in need of any type of electrical services or repairs, then don’t hesitate to reach out to our professionals. Here at Gervais Electric, Inc. Winter can be a fun time of year, but neglecting the safety of your family and home can definitely take the fun out of winter. Don’t delay. Contact our team today for all your home and business electrical needs. We look forward to serving you and send along wishes for a safe and happy holiday season ahead! !